Efficient routing consists of reducing network congestion as well as improving the speed and performance of the overall network. 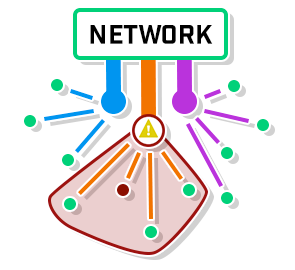 When a network is subnetted, different devices communicate with different networks rather than having all devices on one network trying to communicate at the same time. Think of it like an office: if several people are crowded together in a room to discuss different topics, it can be extremely difficult to effectively communicate. Therefore, subnetting is like creating separate conference rooms to discuss each individual topic. With less devices on the network, communication becomes vastly more efficient and effective. Even for experienced network administrators, managing a network is a stressful task. However, an administrator’s job is simplified by using subnets. Subnets allow administrators to isolate certain devices into logical groups. Therefore, when there is a problem with a device on a subnetted network, it’s much easier to locate the issue because the devices are grouped together. This allows the network administrator to determine which group of devices need attention right away. In addition to logical groups, hosting on subnets is much more efficient for network administrators. This is because of host limits and address allocation; instead of having one network with a limit of 16 million IP addresses, there could be hundreds of networks with 64,000 addresses, which would take much less time to parse through. Finally, the improvement that subnetting provides to a network’s security is an extremely large and underrated benefit. By breaking it up into multiple networks, an administrator has the ability to isolate the compromised network(s). With the ability to isolate the compromised network, the network administrator can prevent further damage to the network and work on addressing the problem at hand. As well as being able to contain and target threats, subnetting can prevent users from hopping around and landing in areas of the network they don’t belong in. Rather than having all resources on one network, it is safer for an administrator and upper management to have a network with the resources that only they have access to. Information is valuable, so all the important information should be separated from possible perpetrators. Subnetting is a beneficial network implementation that doesn’t take much time to learn or configure. Its benefits range from network speed enhancement all the way to protecting valuable information. Because of all the advantages, there is no reason for a business’ network to not have subnets.